Photo provided by Chengru He. “As an artist, anthropologist, and book lover, I have long been fascinated by Mexico’s paper and bookmaking traditions. So when I began UA’s Book Arts MFA program last year, I jumped at the chance to learn more through a summer research trip to Mexico, supported by the School of Library and Information Studies and the Capstone International Center. From as early as 800 AD, the Maya, Mexica, and Mixtec peoples created beautiful screenfold books containing hand-painted text and images, almost all of which were destroyed by the Spanish. 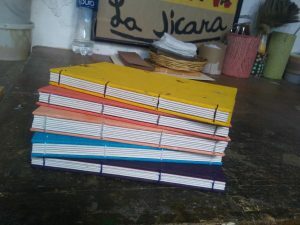 But today, some artists in Mexico are working to revitalize and modernize their country’s paper and book traditions. Among them are the workshops Taller Leñateros in the city of San Cristobal de las Casas and Taller Santos Rojas in the town of San Pablito. I visited Taller Leñateros in the state of Chiapas in late May 2018. The taller was started in 1975 by the poet Ambar Past with the goal of reviving the Maya art of bookmaking. 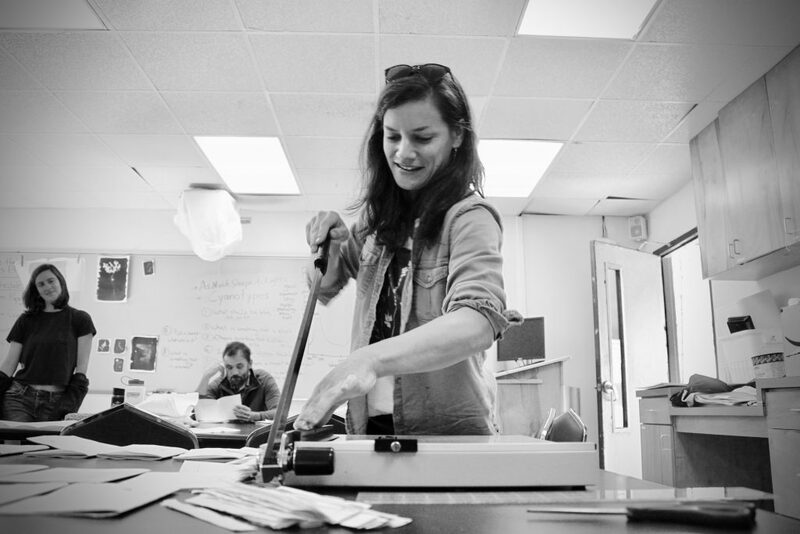 Today, it employs local artists to make eco-friendly recycled paper and print and bind original artists’ books containing Maya songs, poetry, and stories in multiple languages. I did an intercambio, or knowledge exchange, with the four artists at Taller Leñateros. 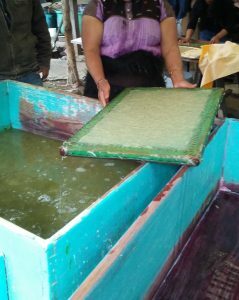 After I gave them bookbinding lessons, they taught me how to make paper from maguey fiber — the same plant used to produce tequila and mezcal. Before I left, I filled my suitcase with many beautiful (and heavy!) books, paper, and prints. In early June 2018, I embarked on the second leg of my trip to learn about amate, a prehispanic type of bark paper. Artisans in San Pablito, Puebla have been continuously making amate since before the arrival of Cortes in 1519, first for books commissioned by the Aztecs and later for religious rituals. Contemporary amate makers are experimenting with different types of bark and are creating modern designs for everything from wall hangings to lampshades. I took a workshop with Juan and Jorge of the Santos Rojas family, who taught me the entire process of making amate. First, we tromped in the woods to harvest mulberry and jonote bark, then headed back to the taller to cook the fibers over a small fire. 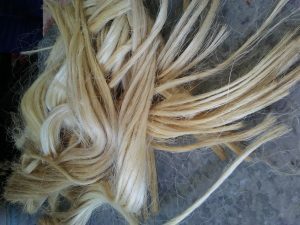 The next day, I learned how to use a volcanic rock to pound the delicate fibers into thin sheets. The pounding process resulted in a lovely marbled-textured paper that I am excited to incorporate into my book work this semester. When I came back to Alabama in late June, I was struck by how we lead our lives almost entirely indoors — from house, to car, to work, to studio, and back again. In Mexico, I spent almost all of my days outdoors. People were always walking and working outside, exposed to the elements; and despite having limited resources and studio space, the artists I met were able to create high-quality, interesting books and paper. I was sad to leave, but I am also energized to spend more time outdoors here in Alabama and start new book projects inspired by my trip. I am incredibly grateful to the Capstone International Center and the SLIS Department for this opportunity.” The Office of Academic Affairs and the Capstone International Center (CIC) are pleased to be able to offer limited funding to students and faculty who are participating in conferences and other opportunities abroad. Please visit the International Funding Request page to learn more. Photo provided by Chengru He.